2018 marks the Chinese New Year of the Brown Earth Dog is said to be a good year for finances but a pretty poor outlook for health and well being unless you keep a close eye on it. Here in the UK, the Chinese Community is one of the oldest immigrant communities in the world since settling here in the late 18th century. The original Chinatown was in London’s Limehouse district and the population was mainly men who were merchant seaman who had arrived here on ships from Canton and South China. The area also sadly became synonymous with opium dens and in Victorian England, the writer Sir Arthur Conan Doyle even had his main character, Sherlock Holmes, depicted as an opium addict and a frequent visitor to the dens. Whilst the community remained in the area from around 1880, the area was massively damaged by bombing raids during the blitz. The Chinatown today was established in the late 70’s and is now in the City of Westminster around Gerrard Street (just off the swanky Shaftesbury Avenue). Today the area is home to over 120,000 ethnic Chinese people which represents almost a third of the Chinese population of the UK. There are Chinatowns in Liverpool, Manchester, Birmingham, Leeds and Newcastle Upon Tyne where the remaining 240,000 reside. The official London Chinese New Year parade takes place on Sunday 18th February 2018, in and around Trafalgar Square. The event includes a parade, acrobatic demonstrations, the mandatory Lion dance as well as a huge number of workshops on calligraphy, kung fu, tai chi and Chinese mask making to name just a few. Of course, over in China, the Spring Festival will last for around 7-days but also includes 3 national holiday days. The children will have 4 weeks away from school which is all well and good if you live in one of the warmer provinces like Nanning where it is around 75 – 80 F but what if you live in Harbin where the temperatures are -38 C.
The eve of the new year is particularly important as the Chinese meet up with all their family at the eldest person house (or close-by) and enjoy a reunion dinner together. This will usually feature meat in the form of chicken and pork and seafood (lobster and abalone – sea snail) and of course dumplings, sweet and sour dishes, hot and spicy and usually a whole fish (head, eyes, tail all intact) but the fish is never completed as to have some left over is surplus and means that the household will never go hungry and they will always have a surplus of money, food, good health and wisdom for the forthcoming year. So, if you are at a loose end this weekend and fancy trying your hand at something a little different, get along to one of the cities detailed and see the fascinating lion dance and all its colour for yourself. Check local press for details. The Chinese New Year does not quite coincide with that celebrated throughout the rest of the world as it works on a combination of the lunar and solar calendars along with additional factors like the elements and colours. The brown earth dog year begins on Friday 16th February and continues for 23 days during which the whole of China ceases major productivity almost two weeks before the beginning of the observance and it is a National Holiday across China and in a great number of other countries who also celebrate the lunar spring festival. Businesses MUST pay all their bills and staff up before the start of the holiday and many will work additional shifts on the run up to the spring festival to enable them to take the time off to be with family and friends. On the eve of the festival like our own new year celebrations they clean house to clear out the dirt which holds onto the bad luck from the previous year. Even sweeping brushes, vacuum cleaners and dust pans are stored away so as not to impact on the newly arrived luck. Another strange one (imho) is that hair cutting over the New Year period is frowned upon as it is considered to bring bad luck on the household. The greatest theme of the Spring Festival is celebration of the family and the biggest migration of people takes place when the ones who have been working away return home with their hard-earned money in time for the reunion dinner. A staggering 1 billion people are known to celebrate the Chinese New Year and in 2014, railways reported 270 million passengers using the rail network on the days leading up to the holiday. The Chinese even have unlucky days like 3rd or 17th but one of the unluckiest of all is the double 10 like the 10th October (10/10) but they also have lucky numbers and the best of all is the number 9. The Chinese year of the Dog is said to be a good year for saving or accumulating wealth. They lavishly decorate homes with red lanterns and children receive prettily decorated red envelopes containing lucky money and the real must have is FIREWORKS. The theme common to most homes across China appears to be red. With some repainting the exterior of their houses with an additional coat of red paint or hanging of scrolls, fish shaped paper decorations and such with red lanterns hung outside and inside the homes alongside Chinese knots. There are also communal events like puppet shows and of course the traditional lion and dragon dancing in their highly decorated costumes. Fireworks and firecrackers have been used to ward off evil spirits but due to the dangerous levels of air pollution over 130 cities have been banned from using them altogether whereas over 500 cities across China have some restrictions in place so some can still continue to enjoy them within these guidelines. 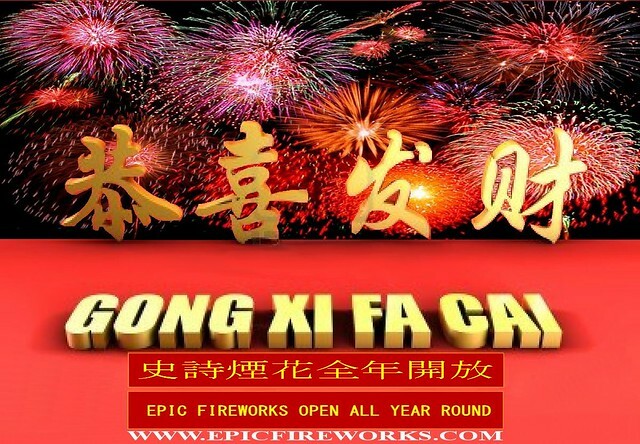 The origins of burning fireworks started back at the time of the Han Dynasty between 206BC and 220CE when the people burned sticks of bamboo which popped loudly thus frightening off the evil spirits which over the years were developed into bunches which became firecrackers. As midnight approaches on the eve of the New Year, several hundred tons of pyro is being lit across the length and breadth of the country ranging from a couple of chains of firecrackers to a full on pyrotechnic display. The legend is that a monster called Nian came to eat villages and destroy their homes and livestock but the burning bamboo frightened him off and the legend continues to this day. Here in the UK several thousand Chinese descend on London to celebrate the New Year annually and we get a small taste of the joy and happiness shared across the globe.